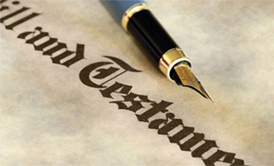 Drafting a will may sound like something that’s necessary only for those who are wealthy. In reality, if you have dependents, investments or a home, you definitely need one, too. With a little organizing, preparing a will is fairly easy to do and ensures that your family and financial goals are met after you die. If you have dependents, it is also the best place to name guardians for your children. To get started, you’ll want to log an inventory of your assets. Include your investments, retirement savings, insurance policies, real estate or business interests, etc. Then, prepare a list of beneficiaries to determine who gets what. Be as specific as possible when naming beneficiaries, stating the person’s full name and their relationship to you. Also, make sure that the beneficiaries listed in your will also match the beneficiaries you name on your insurance policy, 401(k) and any other retirement accounts. If not, these override your will. Experts advise that creating a will is typically not a do-it-yourself project simply because of the complexity of estate law, tax law and property law. Protecting your loved ones and your estate is far too important to leave to chance, so it is wise to work with an attorney who specializes in estate planning. The average fee to draw up a basic will costs between $250 and $450, which is nominal considering its importance and the benefits to you and your family. Most people do not realize that life insurance proceeds are normally included in the estate of the deceased. This can result in up to half of the insurance proceeds going to the IRS with the remainder left for the intended beneficiaries. A relatively simple trust known as a Life Insurance Trust can avoid the taxation of life insurance proceeds and control the disposition of the proceeds upon your death. After you’ve completed your will, you’ll want to make sure you review it every few years, or if you have a life-changing event, such as a new addition to your family, a marriage, death of a beneficiary, a move out of state, etc. You can amend your existing will or draw up a new one. Avoiding or reducing estate taxes, saving estate administrative costs, specifying who will receive your estate and protecting your family are just a few of the benefits a will can achieve. Call our office (203) 359-0880 to learn how we can assist you with your estate planning and insurance needs.